< Previous Post New Capretta Superwash! Knitters of all skill levels will be excited to hear about our new collection, Flaunt! These bulky accessories are as quick to knit as they are fashionable and glamorous. 15 patterns fill these pages showing the ins and outs of how to make some gorgeous scarves, cowls, and wraps. Stay toasty and look fresh all through the fall and winter with these cute bulky knits! The Weft Wrap is my favorite of the 3 wraps featured in Flaunt. 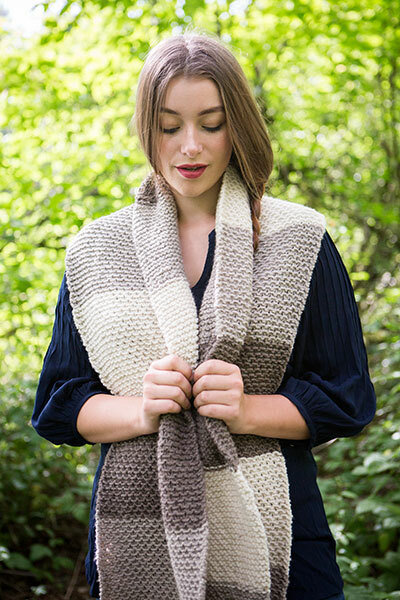 I love the feeling of a wide shawl draped over my shoulders, and this piece really delivers! Worked entirely in knit and purl stitches, the Weft Wrap features a rich blanket weave texture with a garter stitch border to frame it. Simple increases and decreases at the beginning and end of every other row create the slight slant that gives this pattern some movement and interest. 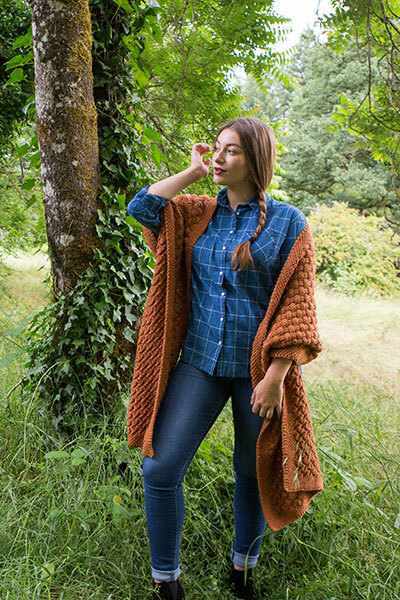 Beginners will love this pattern for simplicity, but even advanced knitters will love wearing it! The Wynt Cowl looks so fun to knit I want to make it twice! As one of 6 cowls in Flaunt it stands out with a twisted stitch pattern that’s achieved without using a cable needle. I love that it looks like an intricate piece but is actually a simple knit that works up quickly! 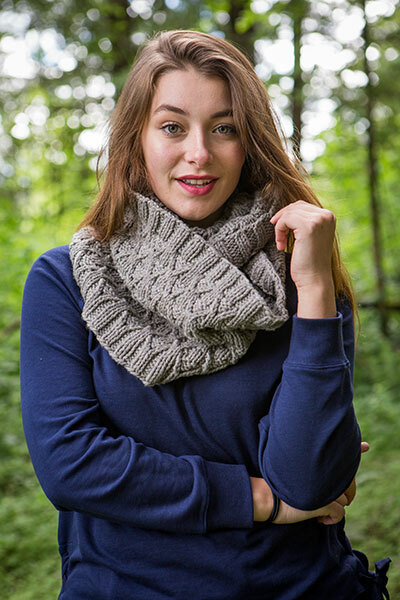 The faux-cable pattern doesn’t just look amazing, it helps to trap in heat, and the 100% Eco Wool of Simply Wool means this cowl is as good for you as for Mother Earth. Another of our patterns to feature Simply Wool is the Simply Stripes scarf; one of 5 scarves that live between the pages of Flaunt. With just a few simple changes to the basic Garter stitch, an intricate-looking pattern emerges that’s made with only the knit stitch! Both cute and warm, this scarf manages a modern take on classic stripes with a fabric that holds some shape and wide blocks of color down its length. For these accessories and so much more pick up Flaunt and start knitting these captivating pieces today!